The Lawrence community is mourning the loss of student Laura Van Asten, who sustained fatal injuries June 30 while riding a horse. She was 20 years old. A flutist from fourth grade until the middle of her junior year in high school, Laura decided to try out the trombone and trombone performance became her major at Lawrence. She was an engaged musician who enjoyed sharing her talents with others at school, church and throughout the community. She was a member of the Lawrence University Wind Ensemble, which traveled to Minnesota this spring for a series of community outreach activities and concerts at several homeless shelters and food pantries in the Minneapolis/St. Paul area. 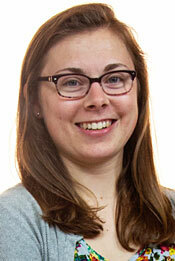 Laura also performed with the Lawrence Symphony Orchestra and the Lawrence University Jazz Ensemble. One of her favorite gigs was subbing with the Big Band Reunion, a 17-piece jazz band that performs regularly at Frank’s Pizza Palace in downtown Appleton. She also recently performed with Wisconsin Symphonic Winds, an adult, professional quality wind ensemble based in Oshkosh, and took great delight in playing with brass groups for Easter Sunday services at a local church. As much as music was a part of Laura’s life, animals of all kinds were her true joy and horses were her greatest love. She began learning about horsemanship as an eight-year old and soon after began riding. As a young teenager, she saved enough money so she could lease a horse one summer that she could call her own. 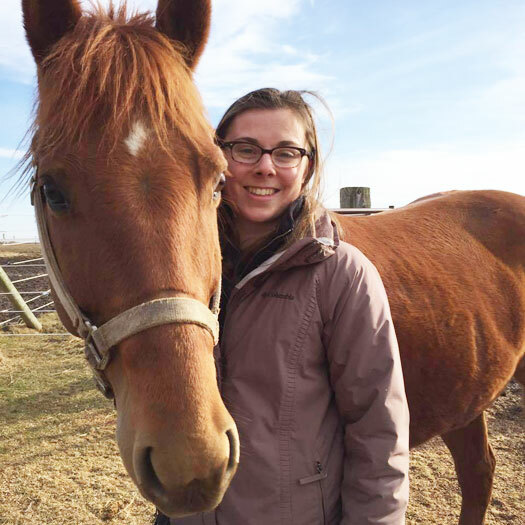 Laura was a volunteer at BEAMING Inc., a local therapeutic horse-riding organization focused on enhancing the quality of life for people with special needs, where she started out as a as a sidewalker and more recently served as a horse handler. Laura’s passion for horses extended to Mulberry Lane Farm, where she held a variety of responsibilities, including tour guide of the petting farm. Her favorite duty was exercising the ponies. Born in Madison, Laura grew up in the Fox Valley, attending Holy Angels/Holy Spirit School in Darboy from preschool through eighth grade. She was a 2014 graduate of Appleton’s Xavier High School, where she performed in band, marching band and pit orchestra. A person proud of, and devoted to, her Catholic faith and dedicated to serving others, Laura was active in the Rock for Life Club and was able to travel throughout the country through the March for Life and Catholic Heart Work Camp. She also was very involved with the Chazoo Warriors, her parish peer ministry group. Laura is survived by her parents, K. Michael and Betty Van Asten, Appleton, her brother Luke, Mishicot, her sister Michelle at home and her boyfriend Isaac Mayhew, a 2017 Lawrence graduate currently living in St. Paul, Minn.
She is further survived by her grandparents, Richard and Mary Sorensen, Madison, and Alois Van Asten, Wisconsin Rapids, numerous uncles and aunts and 23 cousins. A visitation will be held Friday, July 7 from 4 p.m. to 7 p.m. at Holy Spirit Catholic Church, 600 E. Kimberly Ave., Kimberly, with a prayer service at 7 p.m. A funeral liturgy will be held Saturday, July 8 at 11 a.m. Visitation will be held from 9 a.m. until the time of the Mass. Interment will follow at Holy Angels Cemetery, W2796 County Road KK, Appleton. 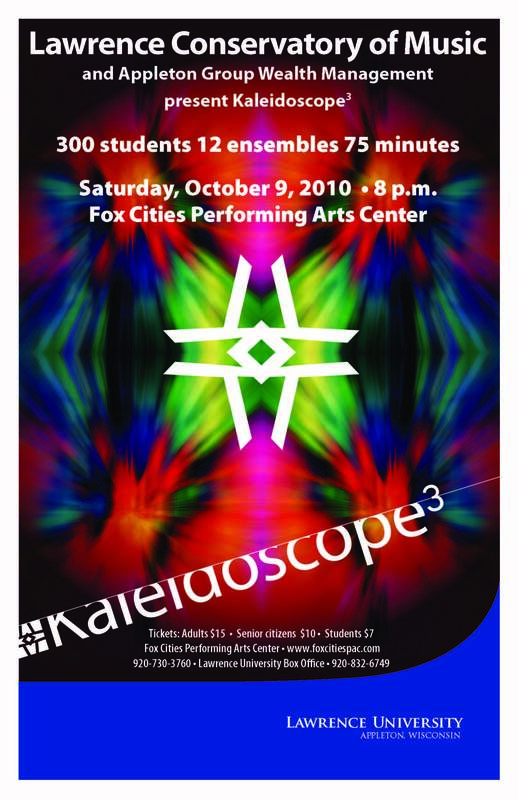 From Bizet to Broadway, Lawrence University’s biennial Kaleidoscope concert promises to strike at least one chord with every music lover. Showcasing the musical talents of nearly 350 Lawrence students, the third edition of the concert will be performed Saturday, Oct. 9 at 8 p.m. at the Fox Cities Performing Arts Center, 400 W. College Ave., Appleton. First performed in 2006, the 75-minute, non-stop musical whirlwind will feature a dozen student groups performing from all corners of the theatre, including the side balconies, main floor and upper balcony. 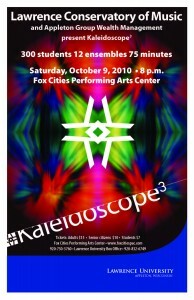 “Kaleidoscope is really the cornucopia of concerts. It is designed to cover a broad spectrum of musical offerings and give the audience a sampling of everything from intimate chamber music and funky jazz to musical theatre and Brazilian percussion,” said Andrew Mast, director of bands at Lawrence and the coordinator of this year’s concert. The program also includes performances by Lawrence’s new gamelan ensemble, the Lawrence Symphony Orchestra, the Lawrence Concert Choir, Cantala women’s choir, the Sambistas percussion ensemble, a string quartet, opera and musical theatre excerpts and a six-hand piano performance. The concert’s grand finale will feature a performance of the “Jupiter Hymn” from Gustav Holst’s seminal work “The Planets” by the entire Kaleidoscope cast under the baton of Lawrence President Jill Beck. Lawrence University gratefully acknowledges Appleton Group Wealth Management, LLC for its sponsorship of the Kaleidoscope concert and extends its deep appreciation for its generous support of this special community arts showcase. Lawrence University musicians will be exceptionally well represented as performers and composers when the 2005 Wisconsin Music Educators Association holds its annual state conference Oct. 26-29 in Madison. The award-winning Lawrence University Jazz Ensemble, under the direction of Fred Sturm, will pay tribute to some of Wisconsin’s most notable contributors to jazz with a pair of conference performances entitled “Homage to Wisconsin Jazz Composers” Oct. 26-27 at the Monona Terrace Convention Center. The Lawrence University Wind Ensemble, under the direction of Andrew Mast, will perform Friday, Oct. 28. The 19-member Lawrence University Jazz Ensemble will be the conference’s opening day featured performer with a Wednesday evening concert and return to the stage first thing again the next morning for a second show. The two performances will feature 10 pieces each, collectively representing the work of 20 different composers and arrangers from across several important Wisconsin jazz constituencies. 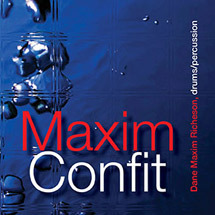 Among the featured works will be four by retired state jazz education pioneers, including “Lady in Satin” by Oshkosh native and 1957 Lawrence graduate John Harmon, who founded the college’s award-winning jazz studies program in 1971; five by current Wisconsin university jazz educators, including “Nzemo Na Mvula Zamba” by Sturm and “Minor Surgery” arranged by Neenah native Marty Robinson, a 1989 Lawrence graduate now teaching at UW-Oshkosh; three Wisconsin school directors; two state natives who graduated from Wisconsin universities; three writers associated with Wisconsin jazz publishers; and three of Wisconsin’s greatest jazz stars, Woody Herman, the legendary big-band leader from Milwaukee, Lyle Mays of Wausaukee, the renowned keyboardist/composer with the Pat Metheny Group and noted contemporary jazz pianist Geoff Keezer from Eau Claire. Collectively the recipient of two outstanding performance awards by Downbeat magazine as well as numerous other individual awards, the Lawrence University Jazz Ensemble has long been recognized as one of the country’s premier undergraduate jazz bands. It performs and records frequently, presenting cutting edge large ensemble literature, historically significant works, Lawrence student and faculty compositions and arrangements and accompanies visiting jazz solo artists. Mast, in his second year as director of bands at Lawrence, will lead the Lawrence University Wind Ensemble in a four-piece concert at 11 a.m. on Friday Oct 28 at the Monona Terrace. Two of his program’s works will have strong Lawrence ties. One piece, “My Robin is to the Greenwood Gone,” was composed by Percy Grainger and arranged by Sturm in honor of long-time Lawrence music professor Fred Schroeder, who was the director of bands at Lawrence from 1951-78. Another piece, “Villanelle,” will feature James DeCorsey, Lawrence associate professor of music, on French horn. DeCorsey also wrote the arrangement for the Paul Dukas composition. 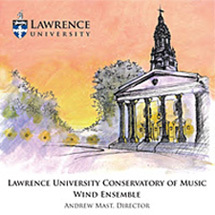 The 55-member Lawrence University Wind Ensemble is selected from the top wind and percussion students in the Lawrence Conservatory of Music and regularly performs five to seven concerts throughout the academic year, frequently with guest soloists, conductors and composers. Their latest recording, “Air Mosaic” was released in the spring of 2005.